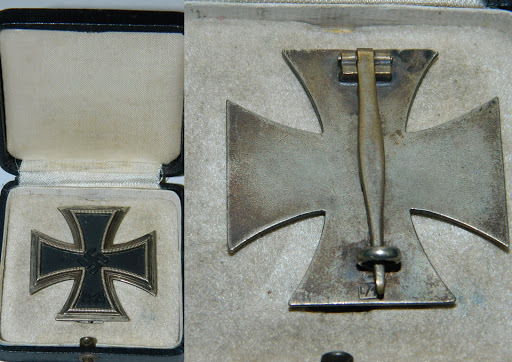 German 1939 Iron Cross 1st class L/11 stamped under the mounting pin. Czechoslavakian Tea Set in pink/cream lustre, 5 cups, 5 saucers, 6 tea plates, sugar bowl and creamer. Fine bone china part tea set 5 cups, saucers, and teaplates, with a purple violet pattern. Large copper tray from Zambia with a central Lion Etched design. 2 ships in bottles 'Winston Churchill' and a 'Spanish Galleon'. WWII German EUF Horster Bayonet with black grip handle. Leather encased hip flask with silver top (James Dixon and Son's Sheffield 1926) and silver fitted cup ( James Dixon and Son's Sheffield 1924) with Engraved presentation on bottom of flask. Crown Regent bone china tea set 6 saucers, plates and cups, pink floral design. 2 Limoge miniature plaques and an EPNS condiment set with a Tankard. Khukri metal dagger, with two mini daggers in a black leather sheath. Stained pine Stool with one carved gothic/celtic end. A wooden casket containing costume jewellery including many brooches one silver and a silver bangle. Quantity of mixed costume jewelery.